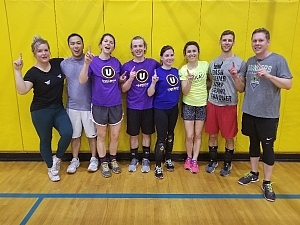 Congratulations to Oh, The Places You'll Throw as they pulled off a comeback for the ages in an epic championship dodgeball match Thursday evening. Brave Little Throwsters came out very strong quickly taking the first two games. However, in a close but pivitol game three, Oh, The Places You'll Throw would win on a fantastic display of honesty, which deserves major props, as despite the call being "ball first", the final player of Brave Little Throwsters admitted to the ball hitting his hand first. Brave Little Throwsters would then take game four and seemingly had it all but wrapped up. With five minutes to go game five began and the awareness of the clock was shown by Oh, The Places You'll Throw. They came out aggressive and with a gameplan to quickly earn themselves a game six and a shot to tie the match. A great game six performance brought them back sending the series to a winner-take-all game 7. During game 7 with Oh, The Places You'll Throw down 5-4 in players, Tim Gheen made a momentum shifting one-handed "dad catch" while holding another ball. With a hit on Brave Little Throwsters just seconds after, Oh, The Places You'll Throw seized a 5-3 advantage on the floor and never gave momentum back as they picked off their opponents one by one and netted themselves a dodgeball championship. Fantastic game to end another great dodgeball season! Tim Gheen by far had the play of the night in game 7 of the championship game. With Oh, The Places You'll Throw down 5-4 in players, Tim made a clean one-handed "dad catch" while holding another ball. This momentum shifting play helped his team never look back and claim the championship. Great game Tim!